Brazilian President Jair Bolsonaro will apparently not move his country’s embassy from Tel Aviv to Jerusalem. Instead, he may announce the opening of a “business office” in West Jerusalem, during his upcoming two-day visit to Israel, on Thursday. 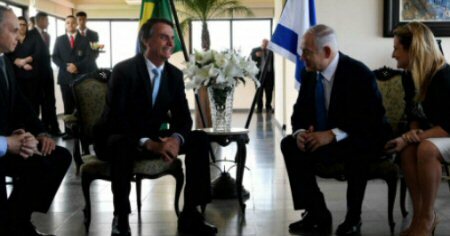 However, Bolsonaro and other Brazilian officials recently appeared to have backtracked on the embassy promise, saying the issue “continues to be under consideration,” and would instead open a “business office” in Jerusalem. Brazilian Foreign Minister Ernesto Araujo told reporters that the government was “still studying” the embassy move plan, Ma’an News Agency reports. It is noteworthy that the Palestinian Authority (PA) has been boycotting the US administration since December of 2017, when US President Donald Trump recognized Jerusalem as Israel’s capital and, then, moved the US embassy from Tel Aviv to Jerusalem, in May 2018. Following recent tensions and the US Trump administration’s undeniable support for Israel has prompted the Palestinians to cut communication with the US, and to declare it unfit to be a mediator during the Israeli-Palestinian peace process.